They always take me by surprise – happen in a instant. Then time slows down filling my mind with a dozen calculations about landing . “Tuck and roll -Tuck and roll” Once gravity has completed it’s duty I access the damage, pausing my garmin of course -sometimes sitting for a while waiting for my body to register all the effects of the twisting and the impact. I wore this as a badge for the balance of my run home. I know every location I’ve tripped and fallen – Every location that I almost tripped and fallen- and mostly remember the actual falls. 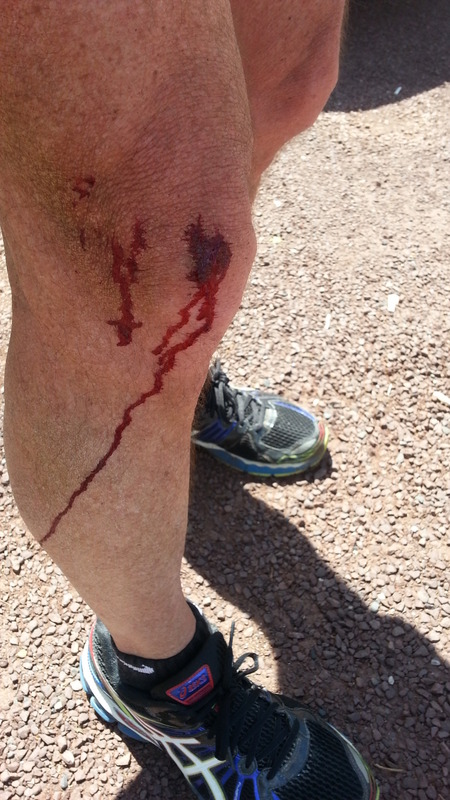 A few have been witnessed by non-runners with gasps – Once I was cheered because of my recovery (tuck and roll)…My worse (to date) was on a gravel down grade allowing gravity to increase the ground impact. I landed with an elbow under my rib cage (Bruised ribs) and multiple scraps and cuts. Had to take a couple of days off afterwards. I’ve done that…sat and took inventory of what got hurt and how much. Plus, as you say, where I’ve fallen is imprinted in my memory. I guess that’s good, so I can try not to repeat it.